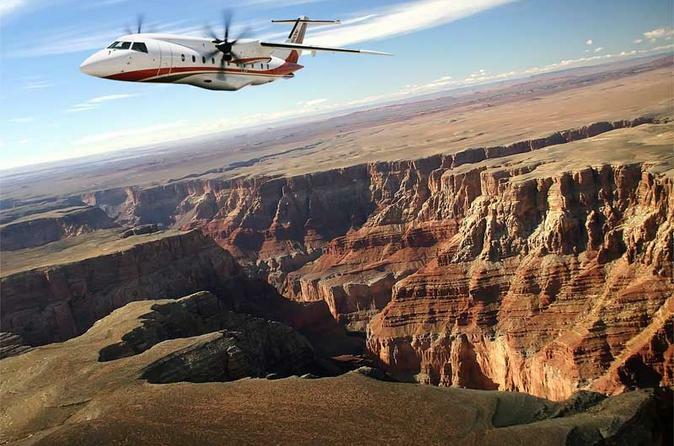 Get aerial views of the Grand Canyon’s scenic West Rim on a deluxe, air-only half-day tour from Las Vegas, and soar above the Las Vegas Strip, Lake Mead and the Hoover Dam as you cross the Mohave Desert towards the Colorado River. Learn the natural and human history of this spectacular place during a 65-minute flight, then swoop over the canyon’s sheer, brightly colored walls. Capture unforgettable images from the plane’s viewing windows, and wheel back towards the airstrip for transfer to your Las Vegas hotel. All taxes, fees and handling charges are included. Fast and budget-friendly way to see the Grand Canyon if you're pressed for time. You're guaranteed a window seat so you'll have outstanding unobstucted views.